If you’ve been teaching very long then you know what I mean when I say that a pencil is a very highly sought after commodity in a school setting. They are CONSTANTLY getting broken and lost and there is always someone in need of one. A teacher’s supply of pencils is a precious thing indeed. So what this teacher did today, is in my opinion a stroke of genius born out of pure necessity. Picture this, it’s the week of ISTEP, tensions are high and the pencil supply is low – it is the first week of March after all. The English/Language Arts practice test is stacked up on your front table and you’ve got seven pencils to your name, seven. And those seven pencils have to last you all week long through two days of practice ISTEP and two more days of the real ISTEP. How on earth are you going to guarantee that those seven pencils will be returned to you and in usable condition? You demand collateral! A pencil for your SHOE! 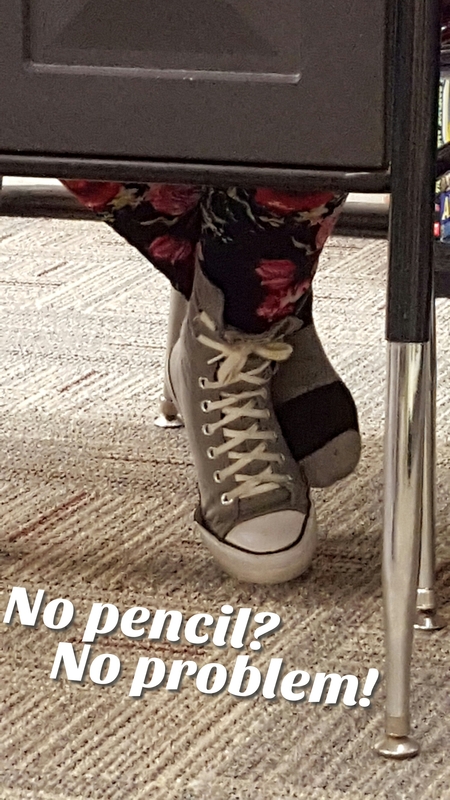 And even though they all complained and there were plenty of stinky feet comments, she got each and every pencil back at the end of the class period. This is totally an idea I am filing away for future reference! Thanks Nina Lechner!